A vaccine (named after vaccinia, the infectious agent of cowpox, which, when vaccinated, provides protection against smallpox) is used to prepare a human or animal's immune system to defend the body against a specific pathogen, usually a bacterium, a virus or a toxin. Depending on the infectious agent to prepare against, the vaccine can be a weakened bacterium or virus that lost its virulence, or a toxoid (a modified, weakened toxin or particle from the infectious agent). The act of vaccinating members of the population is also known as inoculation, though inoculation can mean use of the live pathogen itself. A bottle and a syringe containing the influenza vaccine. The immune system recognizes the vaccine particles as foreign, destroys them and "remembers" them. When the virulent version of the agent comes along, the immune system is prepared for a fast strike, neutralizing the agent before it can spread and multiply to vast numbers. Live but weakened vaccines are used against tuberculosis, rabies, and smallpox; killed agents are used against cholera and typhoid; toxoids against diphtheria and tetanus. Vaccines, though they are by far not as virulent as the "real" agent, can have unpleasant side effects, and have to be renewed every few years. A new attempt to avoid these obstacles of "classic" vaccination is DNA vaccination. The DNA coding for a part of a virus or a bacterium that is recognizable by the immune system is inserted and expressed in human/animal cells. These cells now produce the toxoid for the infectious agent, without the effects other parts of a weakened agent might have. As of 2003, DNA vaccination is still experimental, but shows some promising results. Many diseases such as polio have been largely controlled in developed nations through mass use of vaccines (indeed, smallpox appears to have been completely eliminated in the wild). As long as the vast majority of people are vaccinated it is difficult for an outbreak of disease to spread. This effect is called herd immunity. Some people, particularly those who practice alternative medicine, refuse to immunize themselves or their children, as they believe vaccines' side effects outweigh their benefits, or that not enough is known of the long-term adverse effects to determine whether the harm is smaller than the benefit. Thus, they reap some of the benefits of vaccines, through herd immunity, without assuming any of the risks. 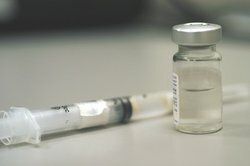 Advocates of routine vaccination argue that side effects of approved vaccines, whilst real, are either far, far less serious than actually catching the disease, or are very rare, and argue that the calculus of risk/benefit ratio should be based on benefit to humanity rather than simply on the benefit to the immunized individual. The main risk of rubella, for example, is to the fetuses of pregnant women, but this risk can be effectively reduced by the immunization of children to prevent transmission to pregnant women. Vaccination against smallpox seems especially contentious. Dissenters falsely suggest that modern vaccines might result in outbreaks of smallpox (in fact, they contain no smallpox virus: they contain live vaccinia virus), and suggest that infections in the past originated (as in the small vaccinia outbreak in England in 1961), spread in greater proportion, and/or were more lethal amongst the vaccinated. They contend that improved sanitation and nutrition, not vaccine, account for most of the reduction in smallpox. Inoculation proponents dispute these allegations, and recognize that the current vaccine has risks. As the risk of the disease (barring germ warfare) is effectively zero, routine smallpox vaccination has not been recommended for many years. In the late 1990s, vaccines became the target of controversy when a link to autism was suggested. Some groups in the United States claimed a link due to a preservative called thimerosal. Thimerosal is a preservative that contains mercury. It was (and in some cases still is) used in some DTP (diphtheria, tetanus and pertussis) vaccine formulations. In sufficient quantities, mercury has deleterious neurological effects, and thus it is tightly regulated (in the United States, this regulation is supervised by the EPA). DTP vaccines are routinely administered to children under the age of 2 in developed nations, so most children in these nations have been exposed to thimerosal through vaccination. In 1999, the FDA re-evaluated (http://www.fda.gov/cber/vaccine/thimerosal.htm) the risk of using thimerosal in vaccine products under the 1997 FDA Modernization Act. In its report of October 1, 2001, the Institute of Medicine's Immunization Safety Review Committee concluded that the evidence is inadequate to either accept or reject a causal relationship between thimerosal exposure from childhood vaccines and autism. In a further report, of May 2004  (http://www.iom.edu/report.asp?id=20155) the institute said that epidemiological evidence favored rejection of any link between thiomerosal-containing vaccines and autism. A second, parallel, controversy arose in the United Kingdom over the vaccine for measles, mumps, and rubella (MMR), another vaccine that is routinely administered to children under the age of 2 in developed nations, but which contains no preservative. A claimed possible link to autism came to the forefront when in 1998, Wakefield and colleagues (http://www.ncbi.nlm.nih.gov/entrez/query.fcgi?cmd=Retrieve&db=pubmed&dopt=Abstract&list_uids=9500320) reviewed reports of children with bowel symptoms and regressive developmental disorders, mostly autism, in a small sample of 12 children. The study had weaknesses such as small sample size, and no use of healthy controls. In 2004, 10 of the 13 authors of the original Wakefield study retracted the paper's interpretation, stating that the data were insufficient to establish a causal link between MMR vaccine and autism. This followed an investigation by Brian Deer for the London Sunday Times, who reported that Wakefield had links to lawyers hoping to sue the vaccines' manufacturers  (http://briandeer.com/mmr-lancet.htm). Further allegations were made by Deer in a UK television documentary, MMR: What They Didn't Tell You, first broadcast in November 2004  (http://briandeer.com/wakefield-deer.htm). The Wakefield study garnered media attention and caused concern in the minds of many parents leading to a drop in the uptake of the MMR vaccine in the UK and some other countries. "Thimerosal and the Occurrence of Autism: Negative Ecological Evidence From Danish Population-Based Data" PEDIATRICS Vol. 112 No. 3 September 2003 (http://pediatrics.aappublications.org/cgi/content/full/112/3/604) - This study shows an increase in autism after the discontinuation of the thimerosal formulations of the MMR vaccine in the Danish population. The autism controversy highlighted several issues pertaining to public health, biological science, ethical standards, and the medical community. First, it stresses the value of large-scale, case-controlled scientific studies in proving or disproving a hypothesis (in this case, a link between autism and vaccines). Secondly, it shows both the importance of medical professionals having the most solid and up-to-date information and the importance of communicating this information in a clear and unbiased fashion to patients. Thirdly, it highlighted the changing role of the medical community from authoritarian wardens to counsellors who provide informed choices, as well as the evolution of the doctor-patient relationship as a partnership. Lastly, it emphasized that current medical issues involve all aspects of modern culture and society, including the media, the affected families, and the scientific community at large.